into the park that borders our subdivision. which are frequented by joggers and nature lovers alike. really had me ready to get outside and see what I could find. all the faux ones out in stores and blogland. This girl was just not gonna pay 7 bucks for a small handful...sorry. along with some walnuts in all their yummy "green-ness"
decorating with stinky green walnuts! just waiting for this kind of display. I used some faux and some real leaves in the mix. all on a bed of dried moss. Don't tell, but I had to glue the "caps" back on these little critters. So, here are some of the sites along the way. Lots of bluebird houses with little wire mesh stoops. with a great display of color on the trees. The fences on the back of the houses across the street. Whatever this once was had been there a long, long time. So we wandered around the trails for quite a while. talking, laughing, picking up bits and pieces. I have to tell you my husband was beyond excited! and oh yea, not bathing for days at a time. Couldn't tell if he was an 8 or 10 point. then wandered on his way. So we both enjoyed our afternoon. Then I put this together today so I could share the fun. I hinted at what my big project was Sunday afternoon. when I search out some Fall Outdoor Dining inspiration. Oh my Debra! That buck just takes my breath away..I could not shoot one in a million years! Great photo shoot! thanks for taking us along on your walk..I just love it. What a beautiful post Debra. Your tour of the hike was good for my soul today. Brought in the pleasures of every season. And how magnificent to see that beautiful deer! I've always thought that our Heavenly Father loves to put on a show for us, if we're just tuned in to see it. I've taken many a nature walk with my son when I was home schooling him, and the Lord would ALWAYS give us something exciting to see! Debra, Your post brought back so many memories of the black walnut tree in my parents' yard when I was a child. My grandmother always picked through them, after they turned black.. and used them to make cakes. I love walking in the woods or finding natural things along the roadside or in vacant lots. I always put my acorns in the oven for a while to kill the little critters that live inside them down here.. and then glue the tops back on too. I can't believe you saw a buck! How exciting! He's gorgeous. Oh.. almost forgot..I LOVE your metal carrier with the natural look. It's perfect in looks and practicality. Thanks for sharing your nature walk. Beautiful fall pics! 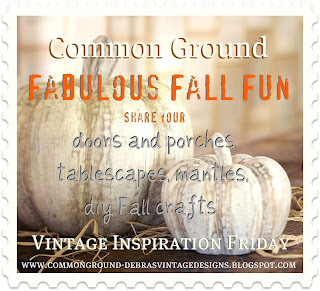 And I love the metal container full of all that fall goodness! I LOVE what you did with you collection when you got back home. My friend, Michelle Palmer, coats her acorns with gel medium. Makes 'em shiny and helps keep the caps on. Can't you just see me sitting with my huge vase-full of acorns, all lined up on my sewing table waiting to dry? Really, I'm considering it! Thanks so much for the inspiration. Hope you have a great week. This is such a lovely post Debra, I truly enjoyed your photos of your woods, so much in them woods, I love the acorns and walnuts for decor, lovely, it is fall, and our leaves have not started turning yet, ugh, still air conditioning going, heehee hard to get in a fall mood with summer days. Have a great day, and God bless you. I feel the same about fruit arrangements, I dried my own and arranged them with pine cones in hurricane lanterns. Debra: very pretty arrangement! I had the EXACT thought about collecting acorns (and hot gluing the caps back on) when my local consignment shop had a bag of 50 fakers for $5! I thought to myself (and probably out loud) "Heck! With all the Oaks in our yard, I could easily collect 50 real ones". Well, it was slim pickins' as the squirrels have beat me to most of them! After I found a good number of beautiful, large nuts, I placed them in a wicker basket, lined with an ivory cover, and left them on my KITCHEN COUNTER over night. UGH! I didn't know, but quickly discovered the next morning, that acorns HAVE WHITE, MAGGOT LOOKING WORMS IN THEM! OMG! Seriously? Well, the squirrels in my yard had an extra surprise that afternoon. :-) LOVE your tray - worm free I suspect. Hi Debra! I had to stop by and say thank you for the post about google chrome, right after I read that post I tried to leave a comment to tell you the tip that had helped me in the past but guess what... I couldn't leave one! so now I'm on goodle chrome and all is right in blogland again :) Thank you!! 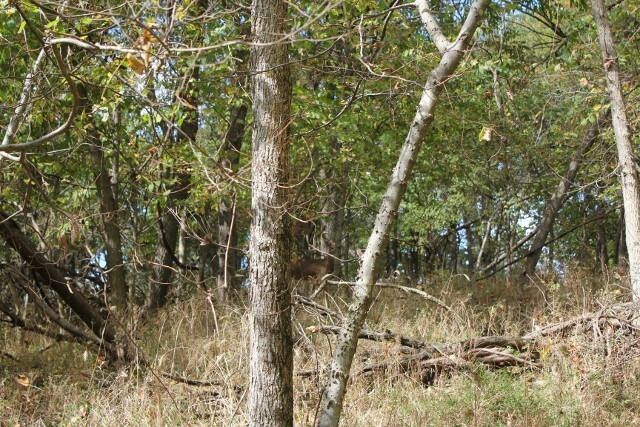 Funnier yet, on our bike ride along our river trail today there was a little buck on the side of the trail to greet us! I love your display, the pops of green are perfect! My husband would have LOVED seeing that buck. He used to go to camp every season as well, now since we've married and live away from his family though. His family still goes hunting every chance they get, for whatever is in season. Beautiful photos of the buck! I hope he survives hunting season. Your tray of fall nuts is very nice too. Au natural! Love the tray. Love the green of the nuts, too. What a grand photo of the buck, stunning animal. Sounds like a wonderful day, and what a beautiful centerpiece you put together!!! That is one big buck. I love seeing deer in our backyard occasionally. Of course Bailey barks at them and they run. I love the nuts you gathered and they look great in your shallow carrier. The park I walk at has tons of acorns. I need to take a bag and gather some to use. What a wonderful tour you had with your husbond, dear Debra- and all those fall "fruits" so beautiful in your metal carrier- is is a very beautiful center piece. Fantastic how he hides between the trees- he looks gorgeous! 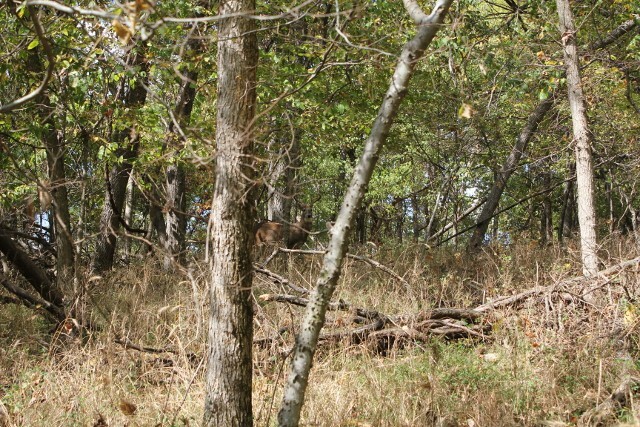 That's so neat that you saw a deer like that while walking in the woods. I guess you were in HIS territory! That's such a peaceful thing to do. Just walking and listening to nature and looking at the Fall colors around you. Sounds like it was a good thing to do especially with what all you came back with. It looks very nice displayed in that metal carrier. Very country! what a beautiful and natural display...love the colors....I LOVE the smell of walnuts. We have a lot of trees on our farm, and our daughter and her family have been picking walnuts to sell.......I always have to stop and smell, earthy goodness for sure!!!!!!!!!! Lovely fall vignette! You may have already done this, but in case you haven't I'll share what happened to me. I collected some acorns for a display, and a few days later there were creepy crawly gross things around. I have since found out that you should bake acorns to kill the creepy crawly gross things. I loved going along with you on your stroll! Debra, my hubs would have been excited....He also loves deer camp and you are right, no bathing allowed. He and the Bug go out back each afternoon for a walk through the woods and today they spied 2 deer but nothing that large. Have a great week! Love your post! Rings home for me. Your arrangement turned out beautiful. Just got home today from our "Deer" camp, preparing for next weekend when Black Powder Season opens. Greatfully, I will be working until 4 pm on Saturday then take a Monster pan of Lasagna, garlic bread and salad to camp and feed several hunters!! Love this time of the year. Debra, what a lovely post! I just love the Fall pictures. The metal box is lovely too! Thanks for such an inspiring post! Hi Debra! You have inspired me to go on a nature gathering walk! My boys would so enjoy hunting for treasures to decorate with, too! I was going to ask if you had to glue the caps on the acorns...and you answered that question! It all looks so lovely together! This is such a wonderful post Debra! I loved the natural wonders you collected and then displayed in that really cool old tool tray! I Need to do this for our dining table too! And then your Quiet encounter on your walk! This is just the perfect Autumn Post and I am so glad I was able to stop by and see it! Debra, your walk sounds like just the BEST kind of simple pleasure to enjoy with your hubby. And finding so many mementos along the way...even better! Now that is what I'd call one productive walk. what any adventure, I can't believe you saw DEER! Your arrangement looks amazing I love the mix of leaves and nuts. It's ME!!! I finally got your blog up! YAY!! I love your arrangement in the metal carrier. So pretty! I want to find some acorns too!! Your house in the previous post is gorgeous as well!! Happy Wednesday!! Gorgeous I love it :-).I tried doing the acorn thing.But I ended up getting worms (YUCK). Well not me but in the jar I had them in.I don't know if there is a secret to it.But I picked many of them with my daughter and after two days there were white worms.I had to throw them out :-(. I need to find that candle it sounds yummy. Living vicariously through you on this Autumn stroll! What treasures you found and created a lovely display - fresh and natural! And, as to your unexpected friend popping up through the trees - stunning! Marveling always at the beauty of God's creation! Thanks for this idea...I'm now going to try and pick up some fall goodies next week in the mountains...love that carrier!! WHat a fun day!! The other day I was sweeping all of the leaves off of the sidewalks...then decided to pick many of the ones up that had 4 or more on their branch...into the old tool box on the porch they went :) got to love free decorating don't ya?!! Wanted to let you know that I used your idea/image in a blog post. I credited it to you, of course, and linked it right back to your blog.